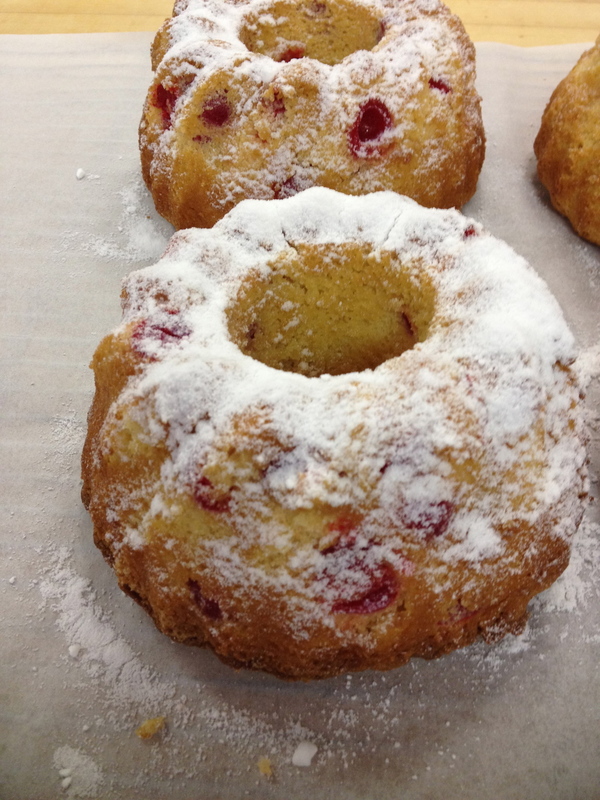 Since this is President's Week and I have been looking at an unused jar of Maraschino Cherries, I thought it was time to whip up some cherry pound cakes. This recipe is intended to make one large Bundt cake (12 cups), but I prefer smaller cakes; one recipe will make three 5 cup Bundt cakes. To make certain that your cherries do not sink to the bottom of the cake, you need to drain them and let them thoroughly dry on paper towel (I let them dry overnight). And don't panic at the amount of cherries in the photo—I am preparing a triple recipe for the store. Your next job is to assemble all your ingredients. My eggs are floating in hot water because they were cold. A simple way to get eggs to room temperature quickly is to submerge them in hot water for 20 minutes. Drain and they are ready to go. The recipe tells you to whip the eggs, sugar, and extract for 5 minutes on high speed. It will look like fluffy, pale yellow whipped cream when it is ready. Now it's time to fold in your cherries with a spatula, carefully by hand. 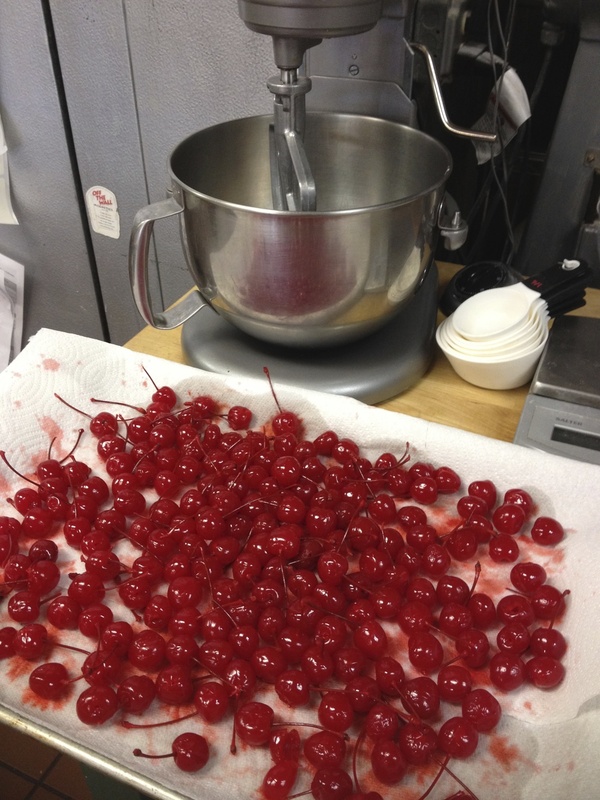 Do not mix with the mixer or the cherries will turn to mush. To prepare your pans, I use both Crisco and a pan spray. 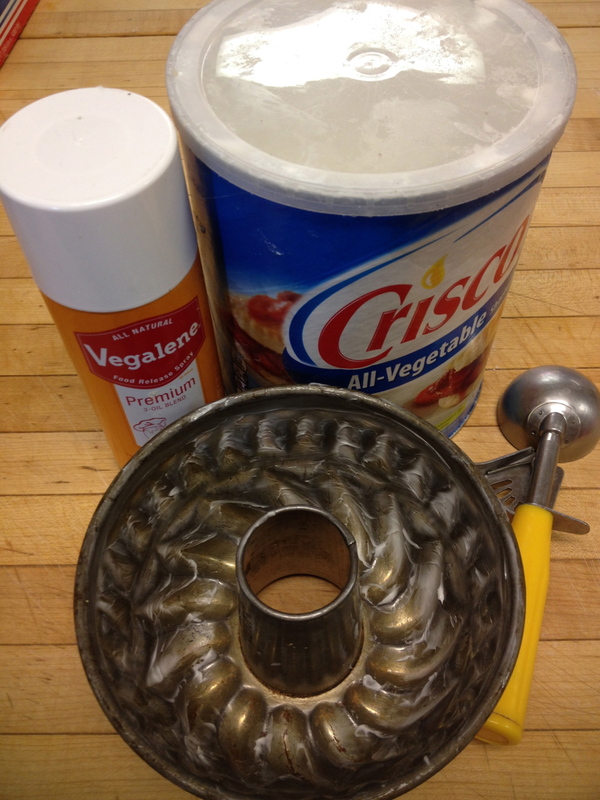 First, I Crisco the pan, then I spray with Vegaline. I prefer Vegaline but if it's not available in your area, Pam will also work. Even though this is a cake, I use an ice cream scoop to get the batter into the pans so each cake comes out the same size. Bake the cakes for 35 minutes if you are using small pans, and 55-60 minutes if you are baking one large cake. Test with a toothpick to make certain they are baked before removing from the oven. Everyone's oven is just a little different. Let the cake (or cakes) cool for 10 minutes and then turn out onto a cooling rack to cool completely. If the cakes do not release, gently push a knife down the sides and center and try again. Preheat oven to 350. Generously grease and pan spray your Bundt pans. Set aside. 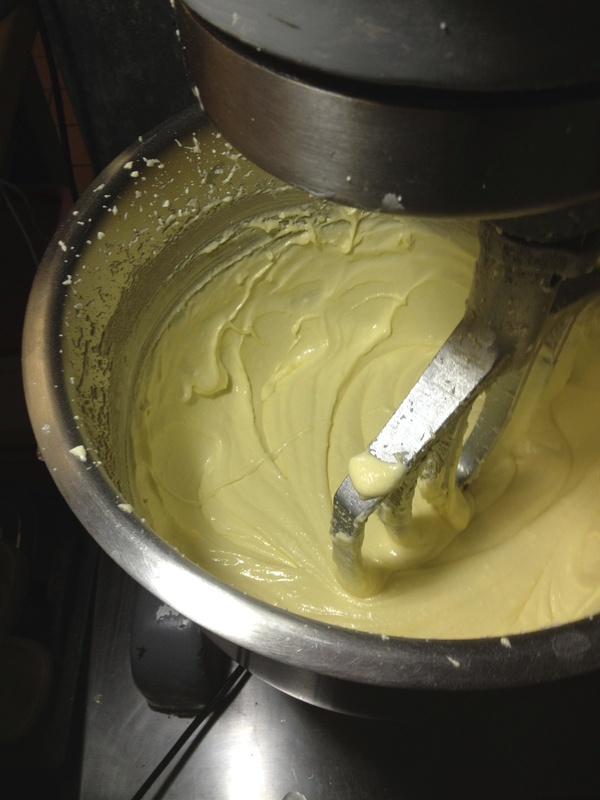 In a stand mixer, beat butter, eggs, sugar, and extract on low speed until blended. Mix on high speed for 5 minutes until light and fluffy. 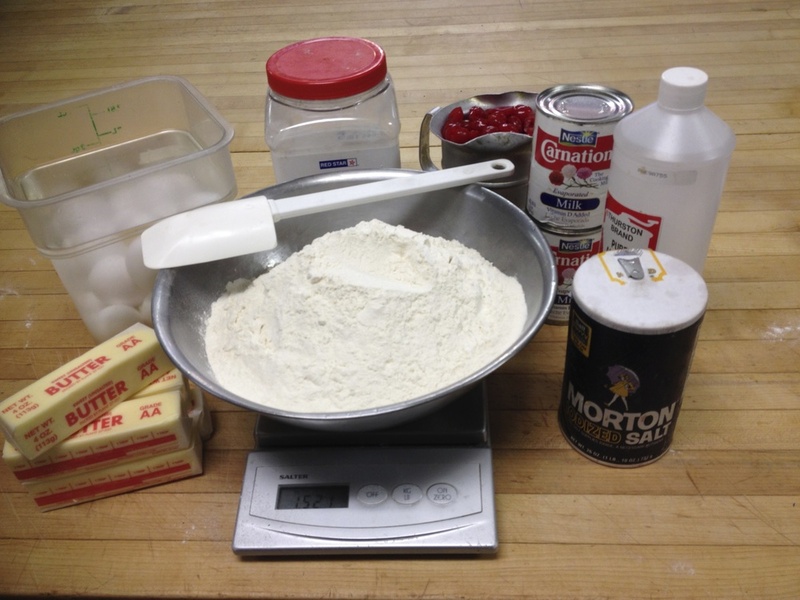 In a separate bowl, combine the flour, baking powder, and salt. Whisk slightly to combine. Add the flour alternately with the milk to the butter and egg mixture, mixing just until combined. Gently fold in the cherries. Pour or scoop into prepared pans. Bake for 35 minutes for small pans and 55 minutes for a large cake. Test before removing from oven. Let cakes cool 10 minutes. Turn out on rack and cool completely. Dust with confectioners sugar or glaze. Posted on February 18, 2014 by Loree Ogan.